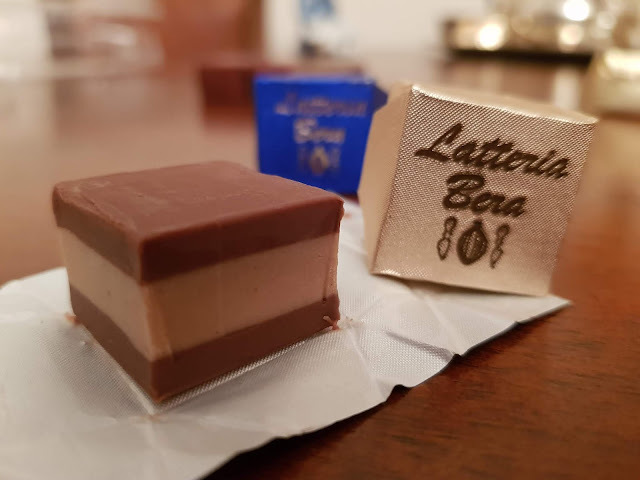 Ms Romola's family lived in the Turin suburb in the 1920s where they owned cows and produced delicious robiola cheese, so when she moved to Turin at 12 it was natural for her to get her first job in a tiny dairy. 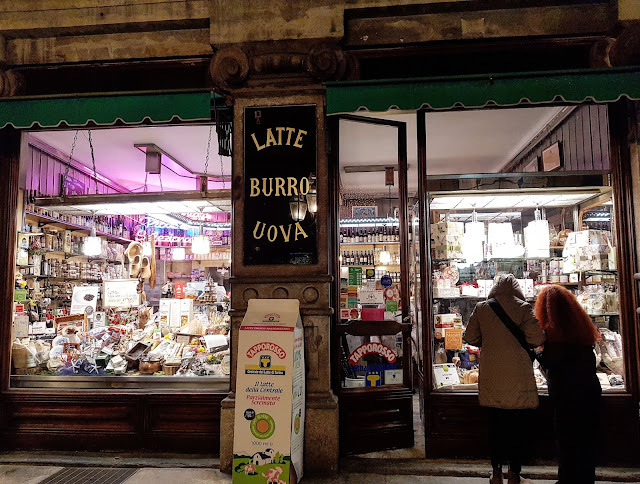 Finally, in 1958, a single mom, fresh of one of the first Italian divorces, Ms Romola started renting a tiny shop in Via San Tommaso13 right in front of the original Lavazza drugstore. It was half the size of today's shop, the counter was in wood and initially it supplied fresh milk to the neighborhood! Back in the 1960s, that amounted to about 600 liters / 158.5 gallons a week counting all the businesses and the homes. She also sold eggs, honey, a couple cheeses and as her business grew up, her sister Bruna joined her in the shop, and more items were added to shop like: candies, jams, cookies, chocolates, pasta sauces, and her super famous whipped cream!! For some reason dairies and whipped cream are a very Turin thing, and of all the Turin's whipped creams, the Latteria Bera one is most definitely THE BEST one! 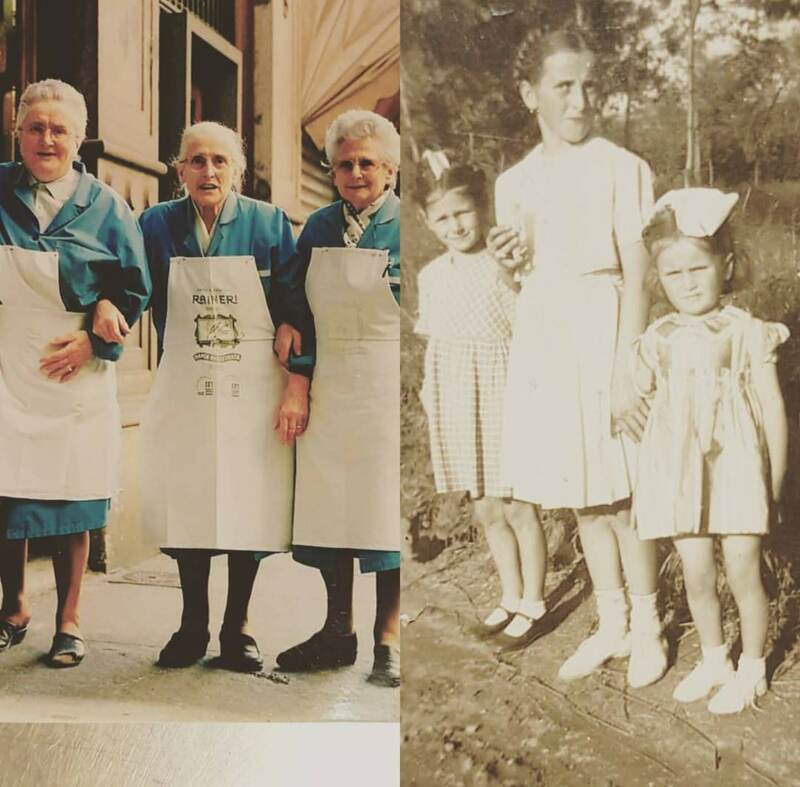 In 1969, Marta, Ms Romola's sister moved her bakery right in front of the dairy reuniting the three sisters in the same area of Turin! When in the mid 1970s, the next door shoe repair shop closed, she requested to rent it and to knock down the dividing wall to join the two shops. This is how Latteria Bera got to its current size and more items were added to satisfy the customers. Ms Romola managed and worked in her shop at full steam up to 2014 when Chiara took over to allow her nonna to enjoy some well deserved free time. Follow Chiara's recollection in her preschool summer memories: nonna Romola would set up a tiny table in the shop's courtyard and build cheese wheels and cheese cuts with some styrofoam. That was Chiara's own cheese shop and they played selling. Chiara made her own cash out some cheese paper and loved giving the change to her customers! 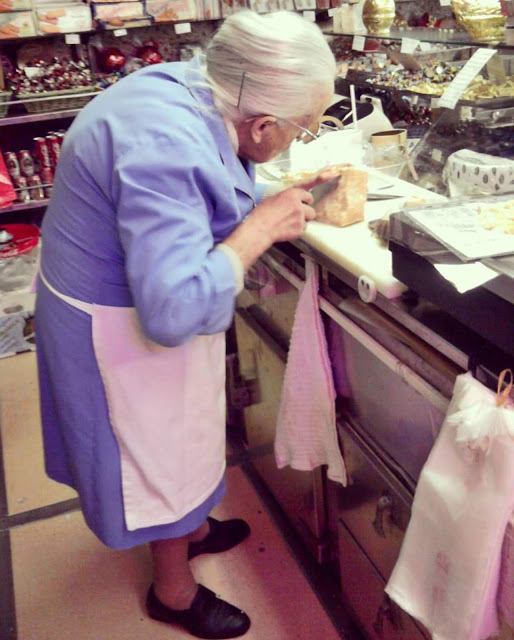 Growing up in the neighborhood, Chiara has always helped nonna Romola in her dairy. Always ahead of her time, as a very independent woman, Ms Romola has always stressed the importance of making both her own daughter and granddaughter two independent women, teaching them a profession, even though they might choose to be and do something else in the future. 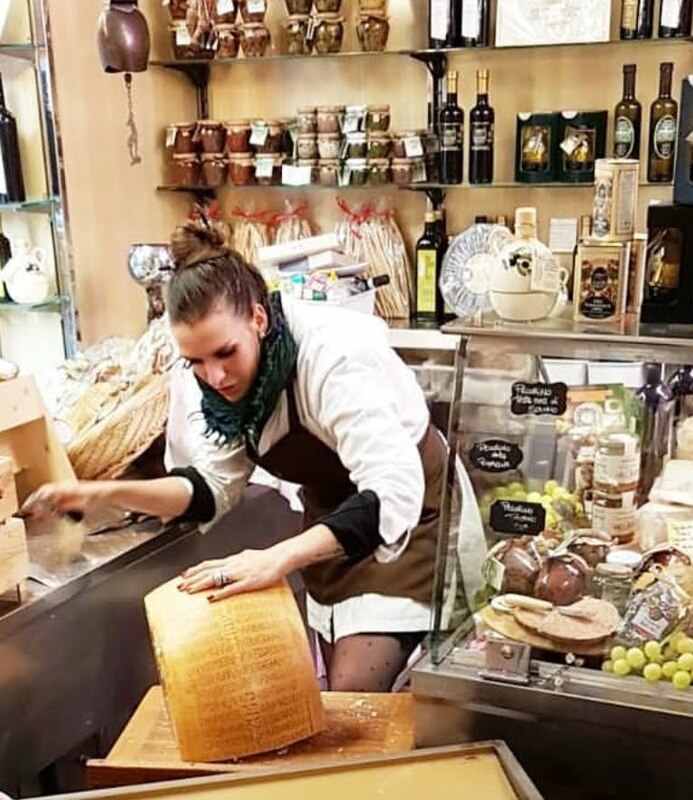 So, during her school years, back from school, Chiara witnessed the cheese cutting ceremony performed by nonna Romola. This is truly a ceremony because cutting a parmigiano reggiano wheel in particular, isn't a joke or a rookie's job. And just like Ratatouille, Chiara enjoyed the tiny cheese crumbs that dropped from the cutting and the cheese crusts. Basically Chiara spent her formative years helping in the shop, serving the customers, packing their orders, thus learning how to network and getting to personally know the community that has been revolving around the shop. This is one of the things Chiara loves the most about her job now: allowing the world to her universe, the shop. And just like an old times' explorer, Chiara fell in love with semiotics and graduated in Communications, and she also worked in a communication agency, before taking over the shop. 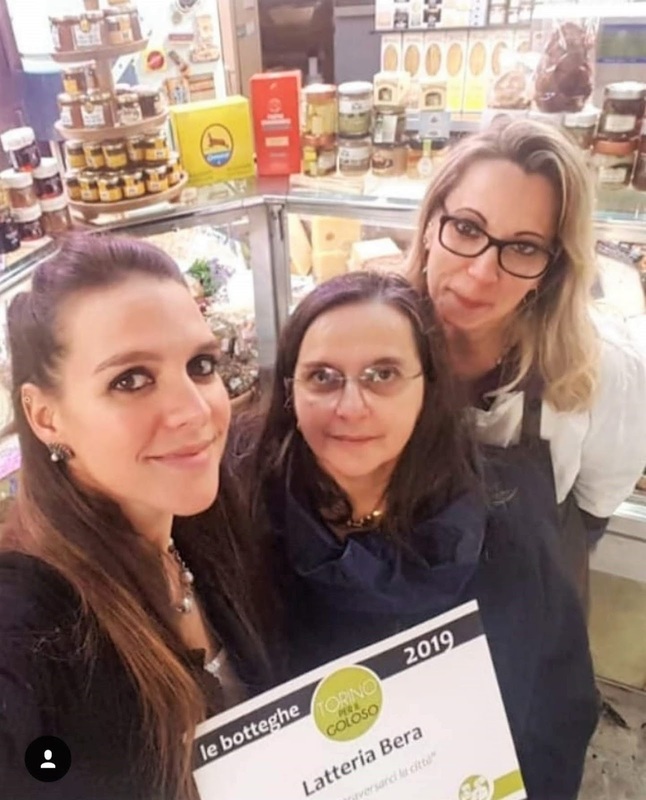 Yet coming back to her family business has been like coming back home: she loves arranging the displays, decorating it and improving it, researching about new products to sell, new small local productions and artisans, in Piedmont and all over Italy. She genuinely loves good quality food, cheese and chocolate. Little by little she is upgrading and modernizing nonna Romola's historic dairy. In fact, an always smaller number of more common brands are being sold to make room for new and unique products. 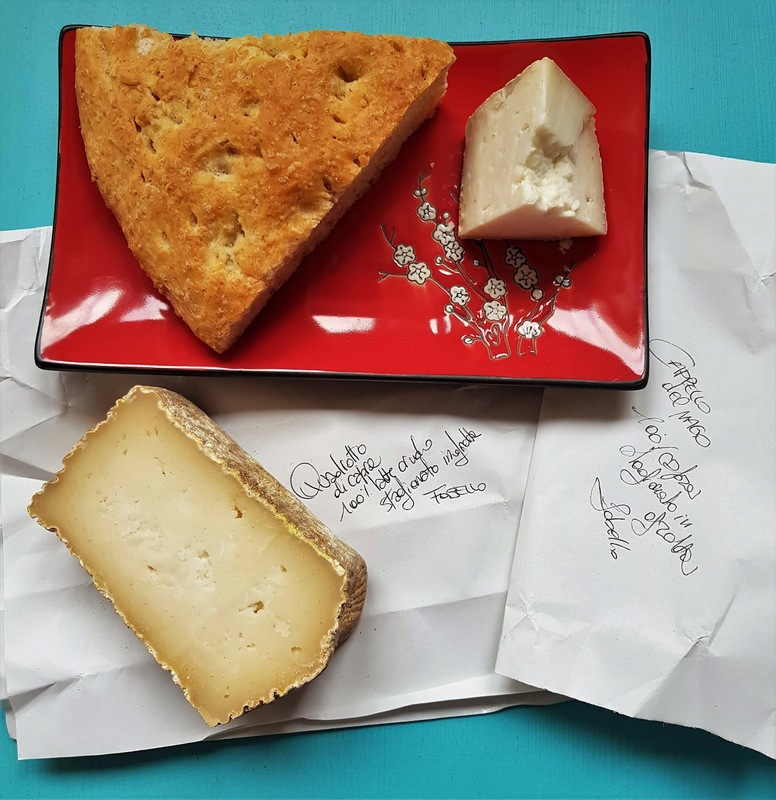 She personally drives up to the Alps to pick up the smallest cheese productions of mountain pasture toma cheeses, like Plaisentiff aka the violets toma cheese. She also gets in touch with other Italian regions' small local producers and drives down to meet with them and taste the products she will choose to sell in the latteria... that by now is almost like a country emporium, selling all gourmet products. 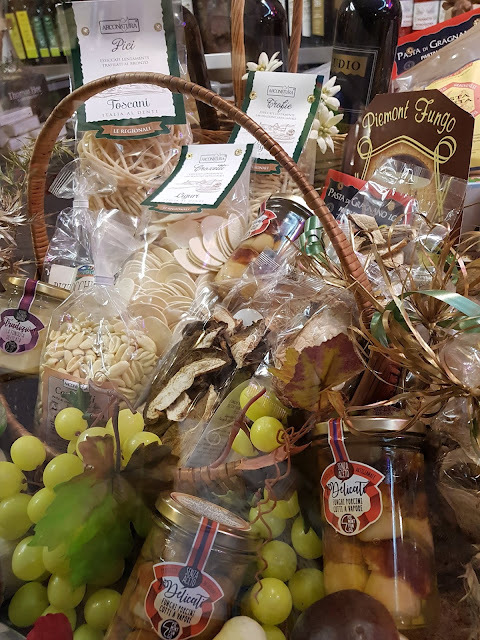 In fact, now you can also buy dry pasta and artisan pasta sauces, soups, some lunch meats, wines to pair with the cheeses and the lunch meats; grappas (Moscato, Barolo, Barbaresco), bitters, local liquors like Val di Susa Génepy; cakes and sweets from many Italian regions. 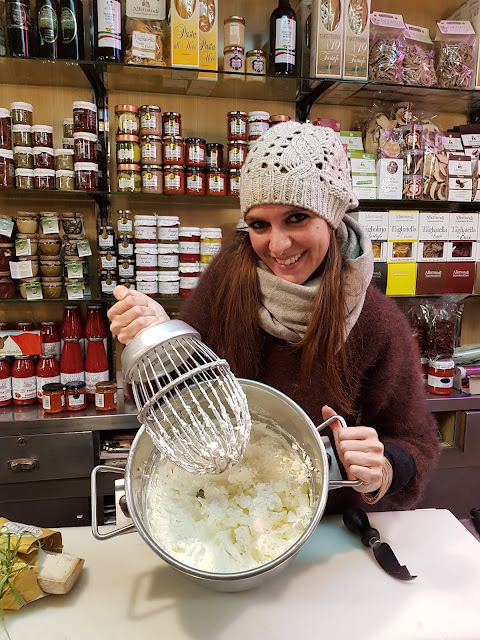 Chiara aims to turn her nonna's latteria into a living and breathing incarnation of the Slow Food mission: a treasure chest holding endangered or little known traditional foods and flavors of Piedmont and Italy. This is why even the milk Chiara has selected and is promoting is made at Cascina Roseleto a natural dairy farm, founded in 1653 near Turin. 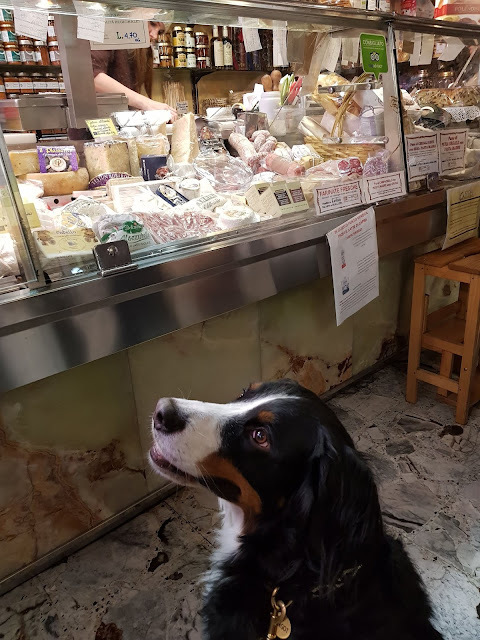 As auntie Bruna retired, Chiara is also carrying on her bread legacy, constantly looking for interesting breads to pair with the over 60 different cheeses sold in the Latteria. We are talking about mountain breads made with rye, low sodium and starter. Chiara's motto is natural and sustainable to support small local productions and this is how in her shop you will also find ucommon flours, meals and the Latteria Bera artisan gianduiotto and cremino chocolates. Margot politely enjoyed her portion on a teaspoon; the old ladies were buying huge quantities for their Sunday lunch dessert and the kids were willing to patiently wait for a new batch when the old one ran out. 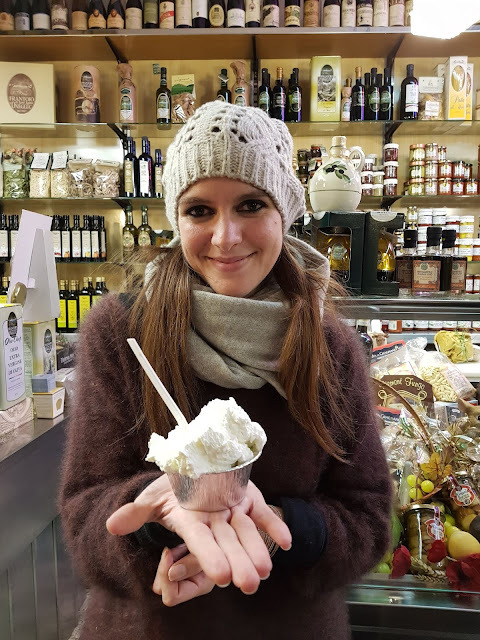 Going to the latteria for freshly made whipped cream is a real Turin rite and most definitely you can't miss out on it. Consider that on December 23rd and 24th Latteria Bera sells an average of over 70kg / 154 lb of whipped cream made with fresh heavy whipping cream, a pinch of vanillin and just a tiny bit of powdered sugar. A generous portion of the Latteria Bera whipped cream wipes all your sorrows away! Mark Latteria Bera down on your Turin to visit shops and best souvenir places. Follow Chiara's posts on Instagram @latteriabera and on Facebook @latteriabera where you can get to know all the products she selects. Should you come when Chiara or her mom aren't in the shop, you will be welcomed by Evelin the Latteria loyal collaborator who is now part of Romola and Chiara's family too! Naturally, we'll always be happy to accompany you to Latteria Bera's during our tours and upon requests, we can include some of their products in our cooking classes.